A new three-year NASA field expedition gets underway this year that will use advanced instruments on airplanes and in the water to survey more of the world’s coral reefs in far greater detail than has ever been assessed before. The COral Reef Airborne Laboratory (CORAL) will measure the condition of these threatened ecosystems and create a unique database of uniform scale and quality. Read more here. 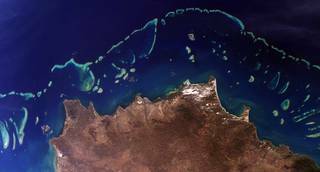 Part of Australia's Great Barrier Reef, one of many reefs that CORAL will study beginning this year.